Released in 1998 and following the lead of "The Faculty" comes another high school horror film called "Disturbing Behavior". Mostly known as Katie Holmes first major film role. She had a bit part a year earlier in Ang Lee's "The Ice Storm". "Disturbing Behavior" is directed by David Nutter who mainly directs in television and most notably from episodes of "The X files". So you would think this would be the perfect fit right? Wrong. The story centers on Steve one of the newest students to Cradle Bay High School. He is played by James Marsden who looks likes he's about 28 or so. His younger sister Lindsey is played by Katherine Isabelle, who later stars in the 2000 cult favorite movie "Ginger Snaps". They have moved to Cradle Bay from Chicago for a "new start" after their brother had died. Steve gets acquainted with a few of the Cradle Bay outcasts/stoners in Gavin and UV an albino kid. At lunchtime, Gavin points out all of the typical high school cliques. The geeks, the motorheads, the skaters and then there are the blue ribbons. The blue ribbons are like the cool kids in a 1950s movie. They are the ultra preppy, letter sweater wearing creeps that really lay on the phony charm just a little too heavy. We are then finally introduced to Rachel or "Rae" the dark-haired, truck driving wanna be bad girl played by Katie Holmes. She is wasted in this role and is pretty much limited to eye candy which is not a bad thing ( just watch "The Gift") but she is barely in half the movie, what the hell? After a number of violent outbursts from members of the blue ribbons, who are mostly football Cradle Bay meatheads" as Rachel puts it. This is true and Gavin and Steve are out to stop it, although we are not really sure what it is. While in the boiler room for some reason Steve runs into the apparently crazy and unhinged janitor who is waging war on the school's rat problem. A gigantic WTF. He has cobbled together a sort of high-frequency radio box to drive the rats out but wouldn't you know it comes up big just as the third act rolls around. This movie is also about the absent parents and their inability to control their kids. When an easy but ominous solution comes along the parents all blindly follow it, thinking its for the best. 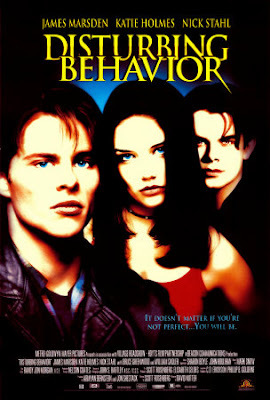 "Disturbing Behavior" tries to be a lot of things and utterly fails on all fronts. It tries to be an extended episode of "The Twilight Zone" as well as a 50s style conspiracy movie, but with a hip 90s attitude. Its poorly cast and only exists to profit off the teen movie craze of the moment. Even though I rip on it now I did see this in theatres and thought it was alright at the time. It has steadily gotten worse. However, if you are so inclined to check it out, even if it only to see Holmes, it's available on DVD and on demand from Amazon.